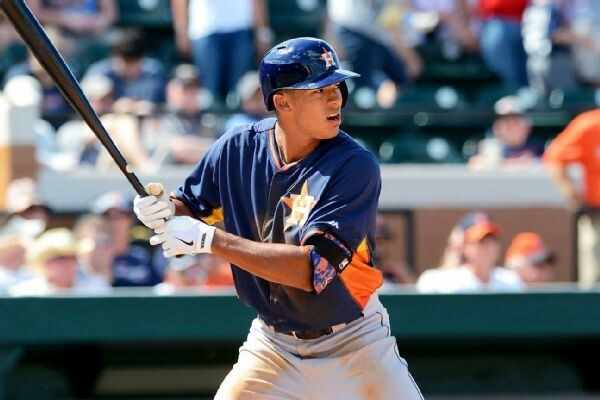 Houston Astros top prospect Carlos Correa will miss the remainder of 2014 after undergoing surgery Wednesday to repair a fracture of his fibula just above his right ankle, general manager Jeff Luhnow said. The injury spoils a spectacular season for Correa who was hitting .325/.416/.510, 16 doubles, six triples, six homers, 57 RBI, 50 runs and 20 stolen bases in 62 games, putting him line to be promoted to Double-A Corpus Christi later this year. The 19-year-old shortstop taken with the top pick in the 2012 First-Year Player Draft out of Puerto Rico in 2011, left a game on Saturday and was hurt while sliding into third base on an RBI triple playing for Class A Lancaster in Lake Elsinore, Calif. The team is hopeful Correa will be able to play in the Arizona Fall League or perhaps winter ball in November. “I talked to him several times over the past few days and he’s taking it about as well as any young man can take it,” Luhnow said. “It’s the first time he’s been injured. He did a lot of research, we talked to several doctors. His parents are here supporting him and he went into this with a very good attitude. He’s determined to work as hard as he can on his rehab and get back as soon as he can.